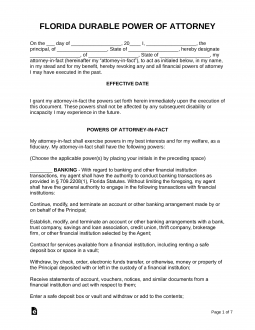 Florida Power of Attorney Forms provides a way for a person to assign his or her legal authority over his or her financial (and other) matters to another person. This allows the other person, or agent, to act on the person’s, or principal’s, behalf. Many people use this type of form when they know they are going to be away or they want to plan for a time when they may be incapacitated. Since the agent will be acting in the principal’s place with the principal’s finances or other assets, it is vitally important that the principal choose someone they trust implicitly. Usually, the principal will choose a trusted friend or relative. Durable Power of Attorney – If someone becomes unable to make decisions for themselves due to an accident or illness, this form allows a grantor the ability to have control over the interests of the incompetent person until the principal becomes competent again. Signing Requirements (§ 709.2105(2)): Required to be signed by two (2) witnesses and acknowledged before a notary public. General Power of Attorney – This power of attorney is for use if someone is going to be unavailable and needs someone to stand in their place. It becomes void, however, if the principal becomes incapacitated. Limited Power of Attorney – This form is for use for a specified time or limited circumstance. Medical Power of Attorney (Designation of Health Care Surrogate) – This form allows a person to pick a friend or relative who will be able to make decisions on health matters, in the event the person can’t communicate or make decisions for themselves. Parental (Minor Child) Power of Attorney – This document allows a person to assign temporary guardianship over their children in the event they are going to be away for a limited period of time. Real Estate Power of Attorney – Allows an owner of a property or a buyer to elect someone else to handle a transaction on their behalf. Revocation of a Power of Attorney – This document revokes a previously entered into power of attorney. It can only be signed if the principal is still competent. Tax Power of Attorney (DR-835) – This document allows a principal to appoint a specific person, usually a tax advisor, who will take care of any filings on behalf of an individual or entity with the Department of Revenue. Vehicle Power of Attorney – This allows someone to act in another person’s stead when dealing with registering and titling a vehicle.